Here's a tee for the 25th Anniversary! It's starring just Amy Rose...and brings you some NEW Neoclassic art to enjoy! This time, she has her hands clasped behind her back, and is looking somewhat shy. The background is salmon-pink checker squares with pieces of Amy line art in them. Notice the brighter pink 25th Anniversary logo at the bottom. Is this tee a little bit cheating? Maybe. The all black shirt has a list of names in a simple sanserif font & different colors. 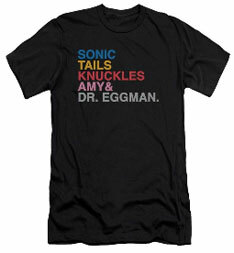 It lists Sonic, Tails, Knuckles Amy & Dr. Eggman, each in the character's color. Without an image....people who had no idea about video games wouldn't know what was going on with the tee. It's an ok idea, and may count for 'subtle-Sonic' category...and it's unique (in official stuff) because it's also a bit of an "Almost-bootlegger" tactic because the words themselves aren't copyrighted...they're only copright if they refer to the character WITH a picture of it OR the whole name of the character with "Sega" or something. After all, there's plenty of people named "Amy"
without infringing on Amy Rose & "Tails" is just a plural noun. So you don't even need to hold a copyright to legally just put words on a shirt & say it's for fans. That's why this one is a bit odd. Another 6 tees from the SegaShop online. This one has a variety of designs, some of which are a little familiar because they are variants, or, were used on other merch. The first tee is a Forces one, with the 'good side' star logo & sihlouttes of the cast in white below it. The whole shirt is black with off-white 'stamped look' ink. Notice there's a sleeve design too, with the Forces logo, making it the most detailed of the bunch. The next two are the same, just one in black & the other charcoal with a big bunch of characters as the only design. You can see Eggman, Rouge, Shadow, Blaze, Cream, Sonic, Tails, Knuckles, Amy & Cheese. All 3 of these tees from the Sega Shop have the 2018 theme of "Colorless motion". This is where a sketchy style is used on the line art of stock art, with varying line weight & often overlapping words or other lin art for the background. It's always either white on black or black on white. Several items (bottles, tees, etc) were made with it. The first 2 tees are just opposites of each other. One black with white art, the other white with black art. And for both of them, Eggman is the star! He's drawn large & at the front of the rectangle design. Shadow is looking disapprovingly on the left side. The thrid tee is Sonic, in white (he's solid) on the black tee with the modern logo. There are words to describe him in various fonts like 'speed of sound', 'fast', 'hedgehog' & more. Each of these is about 25 dollars in adult sizes at the SegaShop online. 3 tees are 100% badguy approved! EACH of these shirts stars ONLY Metal Sonic! The fan favorite evil robot is seldom seen on merchandise, so it's extra special when it can be the star of not one, but 3 things in a row. Each tee is a 25th Anniversary celebration item, and features a different piece of art for MS. 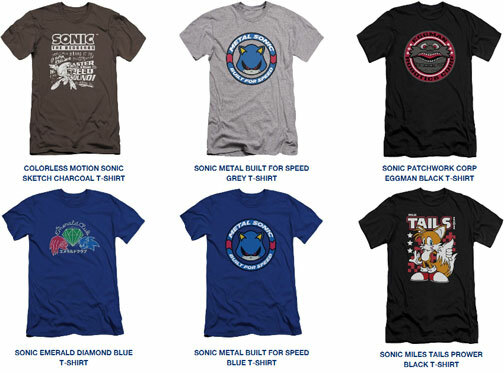 The first tee is a dark charcoal gray, with "Metal Sonic" written vertically in white for the background. There's a 25th logo in yellow at the bottom. He is a large neoclassic stock art in the middle, this time floating with one hand up. The middle tee is a royal dark blue, with the 25th mark in red. The background here is a really large rectangle/edge crop of the 'hand raise' floating MS but all in blocked yellow. This art has him standing at the ready, in full color. The last tee is a mottled light gray. It has the 25th Anniversary winged ring logo with ribbon. This time, its Metal but facing away & the art is fully shaded. His name replaces Sonic's on the ribbon base to the logo. Each one is a real treat for Metal fans, with colorful design, great art and very nice variety. They're all adults sizes, at about 25 dollars each in the SegaShop in 2019. An excellent series of shirts for fans & collectors alike. one above. This shirt is all black, & has Metal Sonic in the 'hand up' pose inside of the winged ring/banner instead of the 'facing away' as it was above. The last shirt is a variant of the dark blue tee above, but this time it's an even darker blue & has long sleeves. It's not a sweat shirt though, it's just a long sleeve tee. The design is still the same good & big size. Each of these are Sega Shop 2019 items & should be about 25 dollars each in adult sizes. As usual, anything starring just Metal Sonic is VERY collectible, and the good design & welcoming sizes only helps these out more. Good stuff! 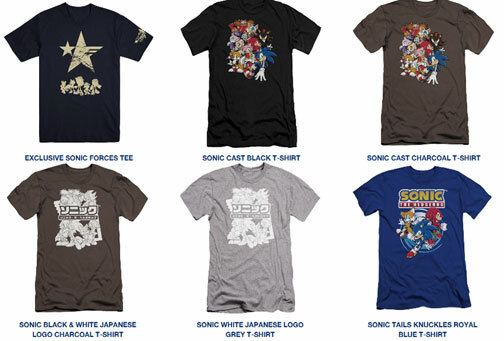 These 6 shirts from 2018 in the Sega Shop are quite the variety of designs & themes. These tees are each a part of a different theme the shop ended up going through later. The first is a dark brown with the "Colorless Motion" theme that appeared on several other items. It's modern Sonic with a scattering of different font words to describe him as the background. The design is all white. The final tee is an all black one with red checker background & SA1 'Tail holding Tails' as the design. It also has his name spelled out (both ways) & some little stars. They later went on to release many other solo-Tails tees, as the store seems to spotlight each character with a line as time goes on. Each tee here is about 25 dolalrs, in adults sizes. The Boom ban continues to dissolve...at JC Penny! Notice the paper tag is still their color trapezoid shape classic one, so it is wrong. The shirt itself is a dull blue. The design isn't amazingly attractive...it looks more like a bingo card or a checker board game. It has alternating red & (shirt) blue squares. 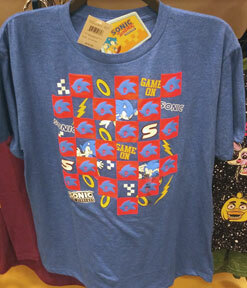 Some have Sonic symbol faces, the letter "S", a ring, the words "Game On", a logo, a lightening bolt, or a few random white checkers. There are also a few Sonic cropped graphics. Red, blue, yellow & white plus the dull blue of the shirt kind of team up to make a design that's both loud and busy but without sophistication. It's in the boys/teens area in winter 2019, and should be about 8.99 when you find it. It is a JC Penny only item. 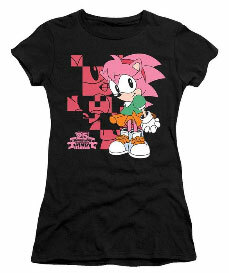 The Sega Shop is really going all out for Amy fans! Sure seems to be. 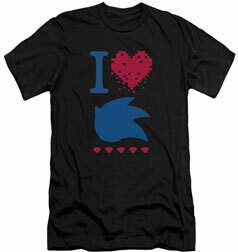 For whatever reason, the Sega Shop online store seems to be releasing various Sonic+Holiday tees. Does anyone dress up for Valentines day? It seems pretty wierd but here's a tee to do so. It uses the neoclassic (new to either 2018 or 2019) "Sonic Cupid Costume" art. It's him, dressed in a white toga thing, with a cupid bow, fake feather wings on his back and holding a valentines card envelope. He dresses up for sports, and Halloween/Christmas, so I guess here he goes again--although it's not super fitting because Sonic and romance aren't really...related? 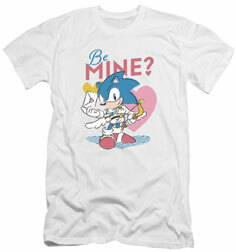 Of course, the shirt here has a hearts background and "Be Mine?" as the text. This one is a bit of an 'odd duck' product...but it is official and buyable in 2019 online for about 20 dollars in adults sizes. But it's lumped in with the 'Valentine' items at the Sega Shop online in 2019. This one's title is "I Heart Sonic", and it's appropriate, if a bit abstract. The letter "I", a red pixelated heart shape, and the silouette all-blue Sonic face make up the 'slogan'. There's a row of red chaos emeralds below the whole design. This isn't particularly a "Subtle-Sonic" item, because the face is clearly him, and everything's really big. The idea is ok, but the shirt somehow doesn't seem particularly cool? It broadcasts a message (probably) but it's not like 'wow that is neat', or particularly bringing in a fun new design. It is buyable in 2019 online for about 20 dollars in adults sizes. Do you remember the official Sonic Toaster? The Sega Shop took pre-orders on it to get it made in a Chinese factory. It appears here on Gear at the Housewares pages. It uses a die cut metal plate to 'burn' (or darken) a Sonic face onto a piece of toast. The toaster was a pretty popular item...but the Sega Shop itself seems to have gotten carried away by it. 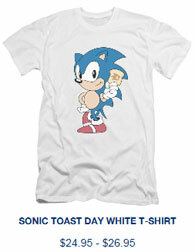 They've gotten so carried away, that they created this entire tee to celebrate the fact that you can make Sonic toast. By altering the 'finger waving' classic Sonic stock art, they use a piece of stamped toast to cover up the finger...thus making it look like he's holding the slice. There is (oddly enough) a mug with this exact same theme. This is a 2019 item.